Hilton Dunkeld House Hotel and Country Club. Dunkeld PH8 0HX, Scotland. The Hilton Dunkeld House Hotel was originally built by the 7th Duke of Atholl as a summer home for his wife, the Hilton Dunkeld House Hotel is is a fabulous country house hotel. . . It is as elegant and comfortable as you would expect, with wood panelling, a stone fireplace and ornate furnishings. It is ideal for outdoor pursuits with Dunkeld Park Activities and LivingWell Health Club on the estate. Find the best deal, compare prices and read what other travelers have to say at TripAdvisor. Ballathie Country House and Estate date back to the 17th Century and great care has been taken to retain the original beauty of the house. Many original features remain giving Ballathie an air of classical elegance matched with a warm and welcoming ambience. Ballathie House, situated South East of Dunkeld, has excellent facilities to offer. Walk in the grounds and be swept away by the natural beauty of the location, relax in one of the reception rooms having afternoon tea in front of the log fire, visit some of the wonderful attractions in the area, or simply indulge in the restaurant and let the award winning chef delight you with the day’s menu. Find the best deal, compare prices and read what other travelers have to say at TripAdvisor. Luxury Hotels Scotland. The Scottish Highlands and Perthshire, offer some of the finest salmon fishing and scenery in Scotland. Tay salmon fishing is renowned world over, Ballathie's riverside location is ideal for a fishing break in the Scottish Highlands. Ballathie House Hotel is located on its own Perthshire estate and offers 42 bedrooms, combining accommodation in the Main House and Riverside Building. Each room is individually decorated and elegantly furnished to the highest standards. All rooms are appointed with private bathrooms, bathrobes and toiletries, trouser press, hairdryer, satellite TV, direct dial telephones and tea/coffee making facilities. Room service is available on request. Ballathie has a reputation for outstanding culinary excellence; Winner of World Junior Masterchef Challenge (2002) and and Scottish Chef of the Year (2000). Ballathie holds 2 AA rosettes. The lunch and dinner menu change daily and encompass a wide variety of fresh local produce. The Head Chef creates dishes combining traditional Scottish classics with a modern twist, which one Taste of Scotland Inspector described as "exceptional". Ballathie House offers an impressive classic wine list of around 350 wines, representing all the fine wine regions of the world. Prices starting from £13.95 per bottle, with many under £20.00. Ballathie House is one of the UK''s leading country house hotels situated on its own Perthshire estate overlooking the River Tay, gateway to the Scottish Highlands. The Scottish Highlands and Perthshire, offer some of the finest salmon fishing and scenery in Scotland. Ballathie''s riverside location is ideal for a fishing break in the Scottish Highlands. Perth, Blairgowrie, and Scone Palace can be reached within twenty minutes and Edinburgh, Stirling, Glamis Castle and Dundee are all within the hour. 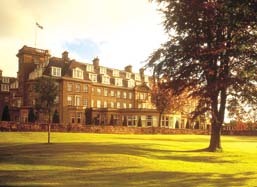 Gleneagles Hotel. Auchterarder, Perthshire, PH3 1BR, Scotland. Elegant, Edwardian golf resort with opulent furnishings set on 850-acre estate. Beautiful Scottish scenery. 1 mile to train. Find the best deal, compare prices and read what other travelers have to say at TripAdvisor. Kinnaird. Kinnaird Estate, Dunkeld, Perthshire, PH8 0LB, Scotland. Elegant 18th-century Country House, now a Hotel, set in a 9000-acre estate, 7 miles from Dunkeld train station. A relaxed but elegant country atmosphere awaits at Kinnaird, where a superb staff delivers care and comfort. Find the best deal, compare prices and read what other travelers have to say at TripAdvisor. Read Scottish Hotel Reviews and Compare Scottish Hotel Prices. Find the best deal, compare prices and read what other travelers have to say at TripAdvisor.